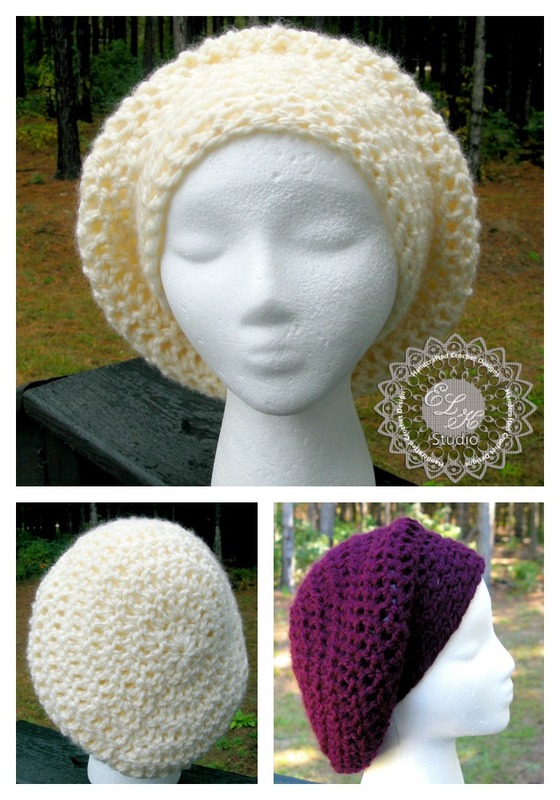 Incredibly Simple Slouchy Hat – Free Pattern! Are you ready for a simple slouchy hat pattern that’s quick and uses only one skein of yarn? Yea, me too especially since the holidays are coming up so quickly! I haven’t played around with chunky yarn very much in my crochet experience but since having used it while making a free cowl pattern from Beatrice Ryan Designs, I’ve come to like the feel and how quickly a project works up. I tried two different types of chunky yarn for this project because I always want to see which yarn can give me the results I’m trying to carry out. My first choice was “I Love This Chunky Yarn” by Hobby Lobby and the other was by Lion Brand. In the end, I chose “I Love This Chunky Yarn” because it was so super soft and for a hat, I think that’s pretty important. Plus from the pictures below, you can see a big difference in the size of the hats although I used the same size hook and number of increase rounds. I didn’t complete the Lion Brand version because I ran out of yarn and really didn’t want to start another skein when I knew I would be using the other anyway. Now, on to the pattern. I made this hat to fit adult size – approximately 22″. dc2tog – double crochet 2 together. Here is a good explanation and tutorial by New Stitch A Day if you need help. Round 14: ch 1 and sc in same sp, sc in next hdc and around, join by sl st in first sc (33 st). I hope you enjoy this free pattern. Please remember that you are welcome to sell your finished products if you wish. I only ask that you reference or link back to ELK Studio as the designer. Please do not use my photos as your own. If you are on Ravelry, you can “favorite’ this project to your list for easy access! I would love to see your version of this hat!!!! You can upload a photo to my Facebook page if you’d like. The link is in my sidebar with the FB icon. Can’t wait to see it!! Do you turn your work after each row? No. This project works in the same direction. I am left-handed. What row did you start the band on. Round 11 is where the band will start to develop. You probably did do everything correctly. Maybe your tension is different from mine. What would happen if this was made in a normal 4 ply yarn? Using the chunky yarn definitely makes it a quick project. Hi there! Great pattern, thank you so much! Was the Lion Brand much thicker than than the Hobby Lobby brand or just not as soft? I’m wondering if the Lion Brand homespun would work. It’s weighted as a 5, I think. I have some chunky Lion Brand (Hometown USA) yarn weighted 6, but I can see that it might be too thick. The Lion Brand was thicker and not as soft as the Hobby Lobby. It didn’t lay as nicely either. Let me know if you use the homespun. Would love to see the results. is this just one skein of yarn? Yes. It took less than one skein. How can I alter pattern for girls size? For 7-8 year old. Thanks. You posibbly could try decreasing your hook size, or since the stitch count is already at 33, you could try decreasing another round to have a stitch count of 22 since it is using chunky yarn. I tried to decrease to size L hook, and decrease an extra round. But it was still way too big. I think it’s because the yarn I used was VERY chunky! I will still be able to use it for an adult. Thanks for the great pattern, and for your help. What yarn did you use? Try to find a chunky but very soft yarn. You can see from my picture that when I used Lion Brand it gave me different results. I’m glad you can still use the hat. Good luck! 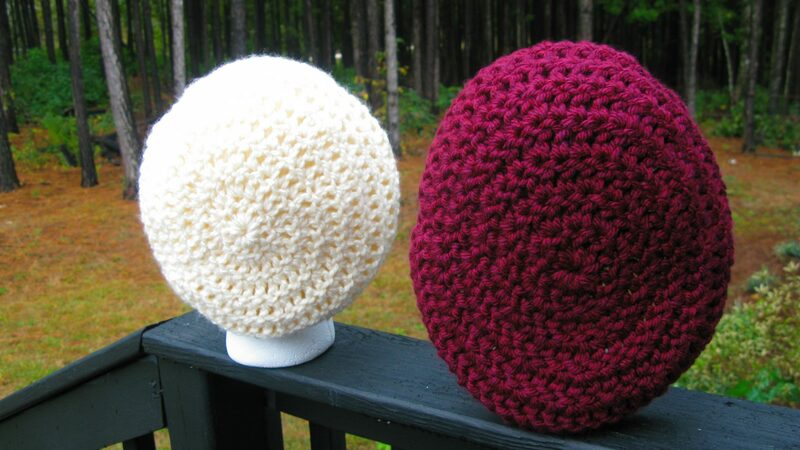 The ivory hat is using the “I Love This Chunky” yarn and the deep red is using the Lion Brand. I would love to see your hat when you’ve finished!!! I have yet to use chunky yarn. Would you have any advice for using worsted 4 yarn instead?? I’m actually working on that pattern now and it wasn’t as simple as just increasing rows. I’ll hopefully have the pattern ready soon. Thanks! Bought lion brand 6 today. Gonna try that. Its 81 yards. How much did u use? Omg just seen u used lions brand in the one u didn’t finish….ugh!!! I’m so sorry! I like the Lion Brand but it didn’t work as well as I wanted it to for that particular hat. It really needs to be a super soft chunky yarn. You could try it and you may like it. You definitely will need 2 skeins of yarn though. Love this simple super chunky hat, I have been looking for a slouchy version so thanks for sharing your pattern. Thank you!! I would love to see your hat! I’ve not crocheted with chunky yet. But I’ve a wool shop visit planned for tomorrow……. which needs hats for all ages. This looks like a good fast pattern for charity knitting. Thanks! I do cringe a bit at the “insanely” part of the name. I’m sensitive to this, as a dear family member is in a psych unit at the moment – and it’s far from simple! I can understand what you are saying about the title. I certain didn’t mean for it to be offensive and can appreciate what you mean. I pray your family member finds healing and peace. I hope you do find the pattern helpful for your charity work. What a great heart you have to give to those babies! Thanks a bunch – you are very kind! I hope you noticed that I changed it toooo……. This hat is great!! Do you have a fb page or are you on Pinterest so I can follow you? Thanks! If you are on the main page of the blog, to the right are “Socialize with me” buttons that will take you to my Pinterest, Facebook, Google +, etc. So glad you want to follow along. Let me know if you have any trouble finding the links. Thank you for the free pattern. It’s a really nice hat. so simple….so elegant. Another lovely design Kathy, thank you. Yay! I would love to see it!